A woman was stabbed to death at E Block in BRS Nagar here this morning. A sweetmeat shop owner, who tried to rescue the woman, was also stabbed. The victim has been identified as Krishna (35), while the injured sweetmeat shop owner has been identified as Kawaljit Singh (45). Accusing the Congress-led UPA government at the Centre of meting out a stepmotherly treatment to the state, Punjab Chief Minister Parkash Singh Badal today said “when there’s a coalition government at the Centre, state (regional) parties do bargaining” and get concessions from the Union Government. The Ludhiana Management Association (LMA) today gave the 35th annual awards to both the young and experienced entrepreneurs and corporates from the state. Six awards in different categories were today given by Chief Minister Parkash Singh Badal to entrepreneurs. A day after the city police unearthed a mega fraud of Rs 26 crore and exposed one of the biggest white collar crimes reported in recent years, bank officials maintained that they had issued the loan on genuine documents and had no dispute with the person to whom the loan was given. 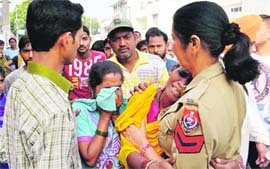 The police and parents have rubbished the link-up rumours between the boy and the girl, who committed suicide simultaneously by hanging themselves from ceiling fans in their respective houses in Kaneja village here yesterday. The court of Additional Sessions Judge SS Panesar has convicted six persons of killing a 21-year-old youth eight years ago with sharp weapons. They have been sentenced to undergo rigorous life imprisonment. The Northern Railway authorities have decided to stop rail traffic for seven hours on the Ludhiana-Dhuri section on September 22 due to the ongoing construction work. As a result, several trains running on this section will either be cancelled, delayed or short-terminated. Peeved at the "indifferent attitude" of the state government towards the pending demands of civic employees, the Municipal Workers Union has threatened to gherao top officials of the municipal corporation and disrupt the working of the civic body. Thousands of devotees converged at Guga Mari Shrine in Chhapar village, near here, to worship snake, the symbolic snake God. Working in a mega district and proving their mettle on a par with their male counterparts is certainly not an easy task for female IAS/IPS/PCS officials here. At the same time, these dynamic officers feel that in district like Ludhiana, they get exposure, learn to work under pressure and gain good experience. 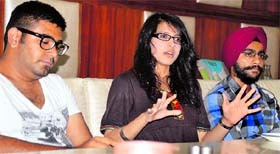 Niharika Sahni, granddaughter of veteran actor Balraj Sahni, was in the city today to promote her upcoming Punjabi movie "Oh my Peau". Ludhiana: Dr Surinder Singh Kukal, Professor of Soil Conservation at Punjab Agricultural University (PAU), has been given the “Dr GS Khush Distinguished Professor Award” in recognition of his significant contribution towards the development of irrigation water management strategies for rice-wheat system. Kundan Vidya Mandir celebrated World Ozone Dayon theme 'For the preservation of the Ozone layer', principal Navita Puri said, " this would help in fulfilling our commitment towards nature, which is facing a number of challenges due to climate change and our habits.” Students of Class VI participated in poster making contest to create awareness for Ozone layer. Two students of Ludhiana College of Engineering and Technology, Katani Kalan, bagged top positions in examinations of Punjab Technical University April 2013 session. The poll pitch is hard to miss in the preparations of the SAD and the Congress that are all set for a show of strength at Chhapar Mela on September 19. 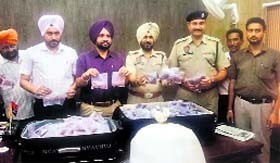 The Khanna police has recovered a huge quantity of intoxicants and drugs during three different raids and arrested five persons in this regard during the night policing scheme in the district. The body of a youngster was found in a sugarcane field here today. The body of a woman was recovered from the same sugarcane field yesterday. It was suspected that both the deceased had illicit relations and they were murdered by the woman's husband and brother. Ludhiana: A 20-year-old man was crushed to death by a speeding truck near the Tajpur road here on Tuesday. The victim has been identified Parveen Kumar, a resident of the Tajpur road area. He was returning home on his motorcycle after visiting the district transport office. The city police has arrested a man and recovered two stolen buses owned by Sunil Sharma of Shri Krishna Travels. These were allegedly stolen by Makhan Kahan of Khanna on September 10. Satguru Uday Singh, head of the Namdhari sect, has got a reprieve from the court in a criminal complaint case filed against him by Satvinder Singh of Katani Kalan village. 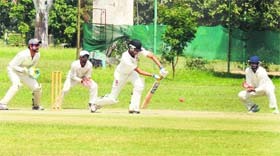 Taruwar Kohli smashed a century (115) while Himanshu contributed 58 runs as Jalandhar surpassed Ludhiana's first innings score of 332 runs to take a slender but vital lead of nine runs on the third day of the match in the ongoing Inter-District Katoch Shield Senior Cricket Tournament being played on the Punjab Agricultural University ground here today. The 16th edition of the Ludhiana District Roller Skating Championship will be held at the Leisure Valley Skating Rink, Sarabha Nagar, opposite Sacred Heart Convent School, on September 28 and 29.